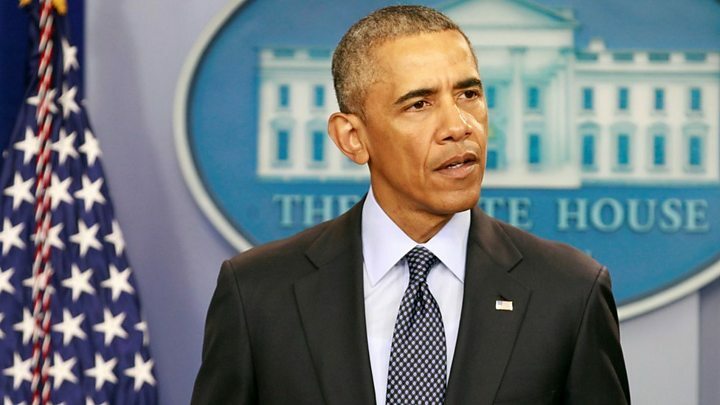 Media captionPresident Obama: "We are united in grief, outrage - and resolve"
US President Barack Obama has described Sunday morning's gun attack on a gay nightclub in Orlando, Florida, as "an act of terror and an act of hate". Americans were united in "grief, outrage and resolve to defend our people", he said. Omar Mateen, 29, killed 50 people and wounded 53 at the Pulse club before being shot dead by police. The so-called Islamic State group has said it was behind the attack, but the extent of its involvement is not clear. A statement on its affiliated Amaq news agency said that an IS "fighter" was responsible. NBC News reported that Mateen had called the emergency services before the attack and swore allegiance to IS. The gunman was killed in an exchange of fire with 11 police officers, after taking hostages at the club. Eight of the victims have so far been named: Edward Sotomayor Jr, Stanley Almodovar III, Luis Omar Ocasio-Capo, Juan Ramon Guerrero, Eric Ivan Ortiz-Rivera, Peter O Gonzalez-Cruz, Luis S Vielma and Kimberly Morris. A moment of silence was observed across the US at 18:00 local time (22:00 GMT). In an apparently unrelated event, a heavily armed man was held on weapons and explosive materials charges in southern California after saying he wanted to go to a gay pride event in Los Angeles. Mr Obama said the "brutal murder of dozens of innocent people" was a further reminder of how easy it was to acquire a deadly weapon in the US and shoot people. "We have to decide if that's the kind of country we want to be," said the president, who has campaigned for stricter gun laws. "To actively do nothing is a decision as well." He added that it was a heartbreaking day for the LGBT community, and that an attack on any American was an attack on all. Later the White House said Mr Obama had postponed a joint appearance with the Democratic Party's presumptive nominee for president, Hillary Clinton. Mrs Clinton said in a statement: "This reminds us once more that weapons of war have no place on our streets." And in a message to LGBT (lesbian, gay, bisexual and transgender) people, she said: "We will keep fighting for your right to live freely, openly and without fear. Hate has absolutely no place in America." Meanwhile her Republican rival, Donald Trump, said Mr Obama should step down for refusing to use the words "radical Islam" when condemning the attack. "If we do not get tough and smart real fast, we are not going to have a country any more," he said. Media captionNihad Awad: "Homophobia, transphobia, Islamaphobia are interconnected systems"
The head of the Council on American-Islamic Relations urged politicians not to "score points" or "exploit fear" in the aftermath of the attack. In a direct message to IS, Nihad Awad said: "You do not speak for us. You do not represent us. You are an aberration." However, officials revealed that the FBI had twice interviewed him in 2013-14 after he made "inflammatory remarks" to a colleague, before closing their investigation. It has emerged that he legally purchased several guns in the past few days. Mateen worked for a private security company. His employers, G4S, said he had worked for them for nine years and carried a gun as part of his job. In a statement, the company said he had undergone screening twice, in 2007 and 2013, and the checks had not revealed anything of concern. His ex-wife, Sitora Yusufiy, said he was "unstable", had a violent temper and beat her up regularly during their short-lived marriage for trivial things like not doing laundry. Media captionEyewitness Anthony Torres fled the scene and filmed as he watched people shooting "back and forth"
States of emergency have been declared in the city of Orlando and surrounding Orange County. Orlando Police Chief John Mina said the attack began at 02:00 (06:00 GMT). There was an exchange of fire with a police officer working at the club, after which the suspect took hostages. Chief Mina said a decision was taken at 05:00 to send a police assault team into the club after police received text messages and phone calls from some of the hostages. 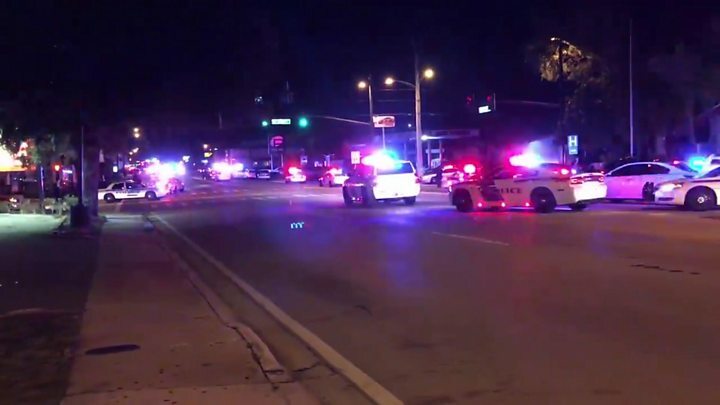 Were you at the Orlando Pulse nightclub? Or nearby when the incident happened?